The Twenty-first Annual Helpers Fund 5k - 10k Races will take place on Saturday, September 21, 2019, with a 9:30 am start in front of the Chestertown Municipal Center on Route 9, Chestertown, NY. The races take the runners through the historic town of Chestertown. The course is relatively flat and fast. Walkers are welcome to participate as well. See below for entry forms, including online registration. 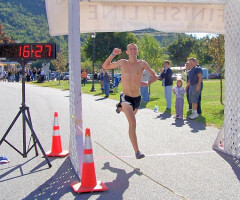 These races are part of the popular Adirondack Marathon Distance Festival, which includes a weekend of road races culminating in the Adirondack Marathon and Half-Marathon on Sunday, September 22 in Schroon Lake. Race registration will be held Friday evening from 6:00 to 8:00 pm, and Saturday morning from 7:00 to 8:30 am at the Municipal Center, Main Street (Route 9), Chestertown. Awards are given to the 1st, 2nd, and 3rd place overall winners, 5k, 10k, male & female. Awards are also given to the 1st, 2nd, and 3rd place winners in each age group. We have great runner's gift bags, plus refreshments following the races. The official results will be posted at the Municipal Center and on this web site as soon as possible after the races. Save the date and enter this fun event now! Online registration is available on the marathon site - please check there for it. An entry form for you to print and mail is available on this site, as a downloadable PDF file (100 kb file). Come join us for a day of activities for everyone. Enjoy the races and enjoy the company. All proceeds will go to assist individuals, families and children facing extreme hardship in their lives. Any questions? Send us an e-mail or call 518-494-5565. See you at the races, September 21st!! Can't participate in the races this year? Contributions to the Helpers Fund are always welcome, at this time and throughout the year. Please see our Contributions page for information on making a donation. Thank you!